Many websites nowadays offer to send updates to the visitor either with the help of RSS feeds or email. Some websites on the other hand that you may find useful come without those options. If you want to stay up to date, you need to find a way to create custom email alerts or feeds to do so. FeedBeater is an online service that can create RSS feeds or email alerts for any webpage on the Internet (that does not require login or is otherwise protected). 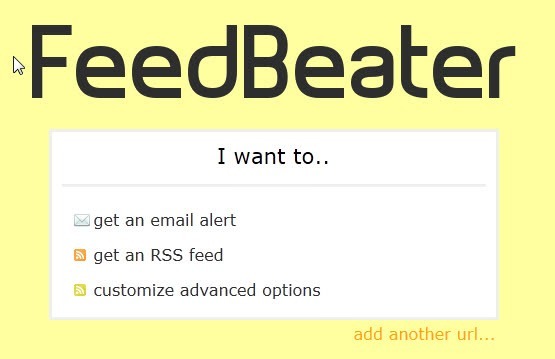 In the best case, all you need to do is to visit the FeedBeater website, enter the domain name or page url that you want to receive updates for, and select if you want RSS feed updates or email alerts. Sometimes though this may not work sufficiently well, for instance if changes are detected that are not of interest or if changes are not detected by the site's script. You can make use of the advanced options in this case. Advanced options load a view of the website in the browser. You have two options to configure custom notifications. The first allows you to add keywords that the page should have or not have. The second to specify an area on the web page that is of importance to you. Changes in that area will then be reported while changes to other areas of the site won't. Both options can be used to fine tune the notification settings of the RSS feed creation and email alert option. The advanced option needs to be selected in most cases to make sure that updates are reported correctly. 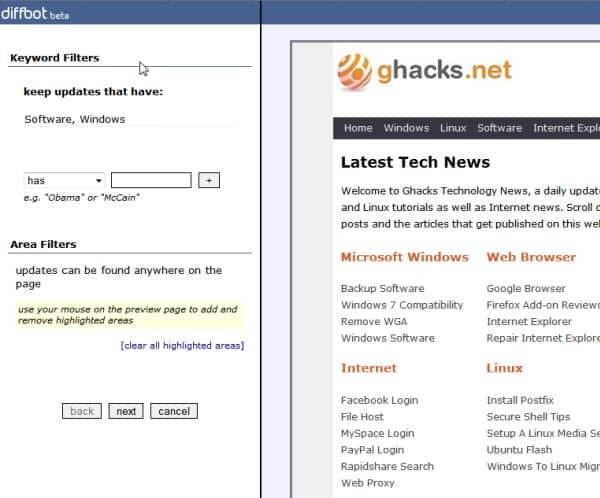 The default parser for instance displayed old posts as RSS feed updates on Ghacks.net. The advanced options allowed me to customize the selection and correct that issue. Users need to be aware that they need to supply an email address to the service if they use the advanced configuration options. Interested users can check out FeedBeater here. Alternatives are Dapper, Feed43 or Feedity to create RSS feeds. Are you using another service to create RSS feeds for pages that do not offer one by default? Update: The FeedBeater service is no longer available. Please use one of the alternatives listed at the end of the article. i will talk to you via the route you give to me tomorrow,i m very sorry for everything that happen,now is time to act chief. Finally a feed creator that’s actually working great. Thank you so much. I use page2rss.com for the sites without rss. feed43 is much more versatile, but FeedBeater is truly easier! Also, FeedBeater is able to send email alerts. By «more versatile» I mean It isn’t possible to create a feed with FeedBeater for truecrypt.org or http://shop.brando.com/ for example. And it IS possible with feed43. Too bad it’s dead now. But I found 2 more alternatives. Thank You! FetchRSS is AWESOME!